From the seventh month to the end of your mare's pregnancy, her foal will gain 80 percent of his birth weight. As you can imagine, this puts an incredible nutritional demand on your mare. Combined with the fact that she may naturally lose her appetite as the foal takes up more room inside, nutrition can be a challenge. In addition to making some dietary adjustments, stay on a regular deworming and vaccination schedule so your mare can get the most nutrition from her food. During the first and second trimester, your mare probably won't require many more calories than she took in before pregnancy. Many mares are able to maintain a healthy weight on good pasture alone. 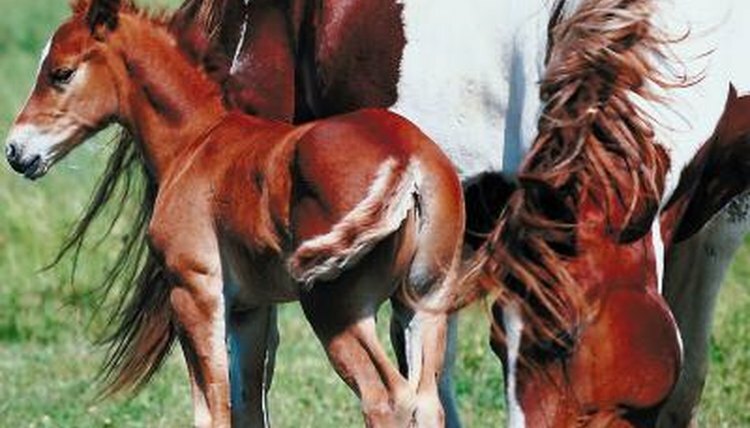 During the final trimester, her calorie needs will increase due to the rapid growth of the foal. A typical broodmare gains 9 to 12 percent of her body weight during pregnancy, and two-thirds of that is during the final trimester, according to Dr. Thomas Lenz in "The American Quarter Horse Journal." Mares who are in good weight or even slightly overweight are better able to produce milk and breed back quicker than underweight mares, says Dr. Lenz. You don't want your mare getting too big however, as an overweight mare can have trouble during the delivery. Gradually increase your mare's grain portions during the last trimester, using the recommendations on the grain bag as a guideline. Offer smaller, more frequent meals to encourage her to eat, and if she is not on good pasture, free choice hay as well. If your mare isn't getting enough protein in her diet, her body will take it from her stores to provide for the rapid growth of the foal. When this happens, the mare develops the characteristically "poor" look some broodmares have, with a large belly but lack of muscle tone and visible ribs. You can increase protein levels by switching from a traditional grain to a higher protein ration balancer feed, which has concentrated levels of proteins, vitamins and minerals. These feeds are a good choice for mares who have trouble eating much because of the room the foal is taking up inside. High quality roughage can also boost protein levels, with some grass hays having 7 percent protein, and alfalfa even more. Your mare builds up her stores of copper, zinc and other micronutrients toward the end of the pregnancy to pass along to the foal, both before delivery and after the foal is delivered through colostrum. If you have had trouble keeping weight on your mare toward the end of pregnancy and she is getting large amounts of forage and grain products, she is probably getting sufficient levels of micronutrients. For easy keepers, free choice access to minerals or a daily serving of ration balancer will ensure your mare and foal are getting what they need to stay healthy. Along with the things you want to add to your mare's feed, there is one thing you should avoid. Fescue is a common grass in many areas of the country, but can be dangerous for your foal. Fescue is commonly infected with a fungus that, while not harmful to most horses, can cause complications in pregnant mares. Mares who are on fescue pasture late in their pregnancy may develop prolonged gestation, foaling problems and repressed milk production after foaling. If you cannot remove fescue from your mare's diet during the last 60 to 90 days of pregnancy, talk to your veterinarian about administering domperidone, a medication that can counter the effects of fescue on the pregnant mare.